March 25th 2019 being the 19th of the second lunar month, it was Bodhisattva Avalokitesvara’s birthday. 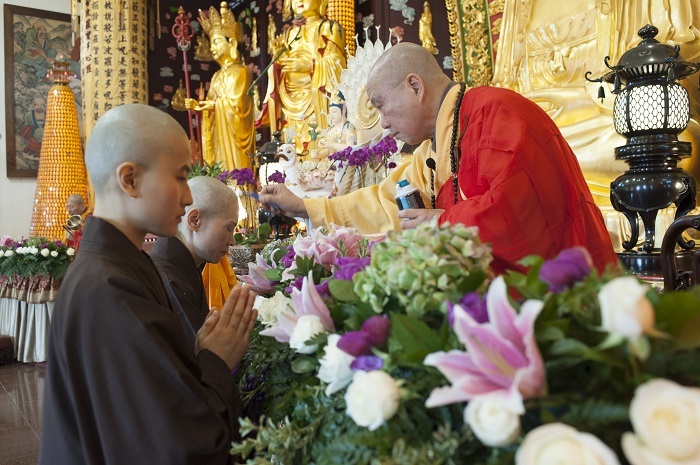 The International Buddhist Temple held a successful seventh ordination ceremony. By 8:00 am, a crowd of joyful well-wishers had gathered in front of the Gracious Hall bathed in fresh spring sunlight. Led by a guard of honor, the two candidates greeted with veneration their presiding monk, Venerable Guan Cheng and the guidance monk, Venerable Yuan Chuan. The bell and drums rang, and so began the solemn ordination. The first candidate, Ms Chan, whose Buddhist agname was Si Yuan, acquired a formal ordination name of Shan Zhen. Born in Hong Kong, she had worked as a civil servant. Her involvement with Buddhism started with listening to Venerable Guan Cheng’s popular radio program Sowing Seeds of Good Karma. In 2015, at an initiation ceremony she received the threefold refuge and five precepts from Venerable Guan Cheng in Hong Kong’s Vinaya, Samadhi and Prajna Lecture Hall. Following that, she attended the first and second short-term Asta Sila Training Camps at the International Buddhist Temple to experience authentic monastic life. Through these activities, she was taught compassion and encouraged to cultivate Bodhicitta to stop evil and do good, eventually helping sentient beings attain wisdom. At a loss for the true meaning of mundane life that is full of suffering and impermanence and searching for a way out to end the cycles of transmigration, she has decided to become a nun. Ms Lam, the second aspirant, with a Buddhist agname Si Xiao, received Shan An as her formal ordination name. Born and educated in Sweden, she had worked as an office clerk. Her Buddhist karma also commenced with following Venerable Guan Cheng’s Sowing Seeds of Good Karma radio program. Thus, since her childhood, she would often hear teachings from Venerable Guan Cheng with her family, and had become joyously aware that Buddhism is full of wisdom and compassion. In 2014, she was converted to Buddhism at the Vinaya, Samadhi and Prajna Lecture Hall in Hong Kong, where she worked as a frequent volunteer. Through learning Buddhism, she has realized that life, full of suffering, is perpetually impermanent, and only Buddhism can set one free. She vows to abandon her worldly desire, and follow the master in practicing Buddhism to cultivate for perfect awakening. Full of gratitude, the two newly ordained nuns thanked Venerable Guan Cheng for his compassion in accepting them into monastic cultivation. They were determined to follow the teachings of Buddhism, act on them, and take vows of benevolence to help sentient beings in attaining Buddhahood in the long run. 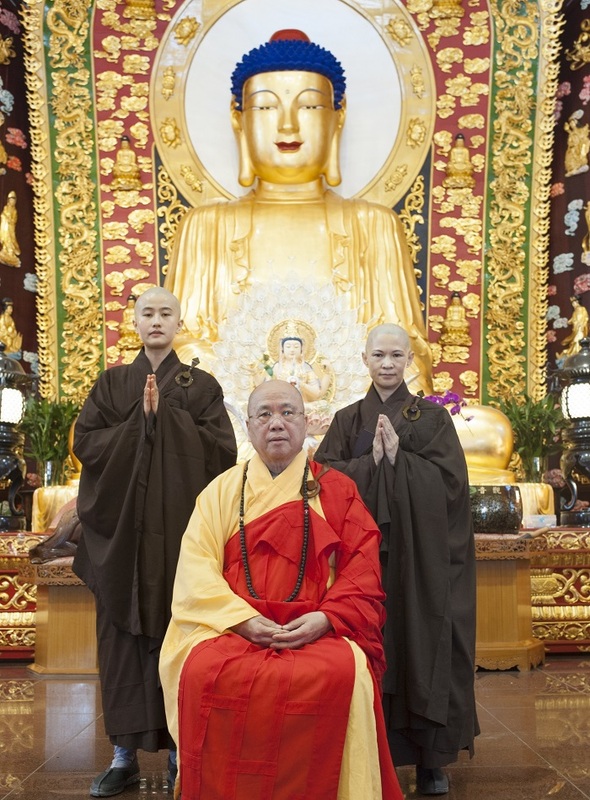 At the ceremony closing Venerable Guan Cheng said that it is a courageous for them to forgo their worldly desire and leave for full-time, life-long cultivation as monastic Buddhists. Compared with practice at home, monastics have a far better learning environment to pursue awakening as they forsake all secular associations. Towards that sacred goal the two novice bhikkhunis have taken the very first step. He wished them further perseverance and fortitude in nurturing vinaya, Samadhi and prajna with self-cultivation, and advised them to work hard at ultimately assisting countless other sentient beings in achieving perfect wisdom.